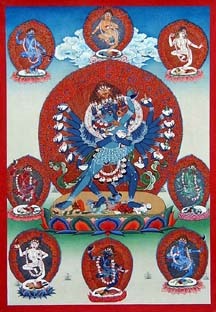 Hevajra belongs to the supreme yoga tantra and is practiced by the Sakya Order. He is shown as dark blue, with sixteen arms, and eight faces, ands four legs. He wears bone ornaments, a crown of skulls, and a garland of 51 freshly severed heads. He is trampling lesser gods. In each of the sixteen hands holds a skullcap. The skullcaps on the right each hold animals, the ones on the left hold Hindu gods. He is shown in sacti with his consort.